These days more and more people are recognizing the fact that traveling while you’re young is more advisable than traveling only when you’re settled down with a family or retired. While the latter time of one’s life is likely to be more financially stable for comfortable travel, it is also a time of either too many responsibilities and obligations, or a time when age can skewer your perception and thoughts, leaving you a little bit less daring and open-minded. The advantage of traveling while you’re young is you are more able-bodied, more tolerant of unideal conditions and accommodations (like some dorm hostels), you learn and adapt faster and better, and you are more thirsty for adventure. The only catch is, traveling while you’re young means traveling with a young person’s budget a.k.a. a backpacking budget where you’ll most likely need to stretch each dollar you spend trying to get the biggest bang for your buck. It is important to note that the lifestyle of a backpacker in a foreign country is not for everyone. It is not at all luxurious and more often that not, it will be uncomfortable, but the beauty of it is you will see and learn so much more about a place than if you were to just hop on and off a tour bus. Hundreds of thousands of young backpackers flock to Europe every year, with nothing but a backpack crammed with simple clothes and essentials, a camera, a very comfortable pair of walking shoes, and just enough money for a place to stay, cheap food, and basic transportation. 1. Europe changes your viewpoint on life. Your horizons will expand exponentially as you keep exposing yourself to the different and beautiful sights and cultures for the first time. You’ve got to experience Spain, France, Italy, England, Germany, Austria, Switzerland, Portugal, Czech Republic, Hungary, Poland, etc, etc, etc… So many countries and cultures to whet your appetite. 2. You’ll meet some of the most interesting people in the world. From fellow backpackers with endless stories of their own travels, to locals who can teach you a new language, way of life, and culture, you will find that the people you know back home pale in comparison. 3. You get to escape your routine life. There is nothing more therapeutic than a reboot in a far away place. Whether you’re getting out of a boring rut, looking for inspiration or getting over loss, backpacking Europe will heal you and you will grow from your experiences abroad. 4. You will learn things no amount of schooling can teach you. Simple but enriched travel in Europe forces you out of your comfort zone, keeps you on your toes, and makes you adapt constantly. 5. You get to know a country on a deeper level. Walking a city’s streets, eating street food and people-watching shows you a place’s real soul. One thing that you should do is make it a habit just to say :”Hi” to people. Anybody and everybody, doesn’t matter. Just get into the habit of saying a simple hello and you will be surprised how easy it is to meet people from around the world on your travels. 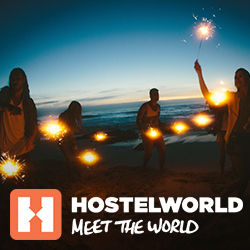 Here’s a party hostel in Budapest, Hungary. 6. You toughen up. Backpacking can be harsh, but you will ultimately find that you can only get better at it. Coping with these stresses will translate to your ordinary life back home. Traveling alone or with other backpackers will help you learn to trust your instincts and gut feelings. 7. You will appreciate the little things more. After a week of sleeping in tiny capsule-like hostel rooms or big rowdy hostel dorms and having to share a bathroom with 10 other travelers, you will truly appreciate and cherish the comforts you have back home. Like the movie Cast Away where Tom Hanks is stranded on an island for 4 years and after being rescued, he’s lying on the floor next to the bed turning on and off a little light. And also the lighter scene where he’s just in awe of being able to click on and off the lighter after learning the difficulties in making fire from wood. How much he appreciated the little things back home after his experiences on the island! 8. Europe is just downright gorgeous. No other continent in the world can be as consistently breathtaking as Europe. Within a few hours by hopping on and off trains, buses, or cheap flights, you can be in so many different countries and get exposure to different cultures. 9. You will see things and people differently when you come back home. You will constantly compare your country of origin with the places you visited in Europe, and there is nothing wrong with that. It is a great quiet past time for your mind and gives you a better grasp at different realities. You’ll also notice how people’s faces light up when you’re having a conversation with them and they find out that you’ve traveled to places that most of them of dreamed about. 10. You will have countless stories to tell. All the memories you make exploring Europe will fill your heart and mind and you will be eager to be the story teller of your group once back home, and they will love listening to you and learning from you. Do not overthink the value of the US dollar versus Euro. As of this writing, the US dollar is almost equal to the Euro so it’s a great time to get more for your money in Europe. But at the end of the day, there will never be a “right time” to backpack Europe, because you will only grow older and have more responsibilities. You can always make more money, but you will run out of chances to make memories. Your say. Have you backpacked Europe? Got any suggestions? We would love to hear from you. Leave a comment below! Previously i was thinking that Europe is expensive place for visit but after reading this post i realize that i must go for this travel.